Do I Need a Chimney Sweep? Can I DIY? Do I really need a chimney sweep or can I DIY? Aren’t there fireplace and chimney tasks I can do myself, without special training? And how much money will I save if I do the chimney maintenance and repair work a chimney sweep would charge me to do? If I maintain my fireplace and chimney myself, what products would I need, and how much would they cost? After paying for the chimney repair materials, would there still be a significant savings? If you are handy around the house, used to doing home maintenance tasks yourself instead of paying someone else to do them, and comfortable working on the roof, you have probably asked yourself at least some of the questions above. The infographic below answers these questions. See a comparison of how much chimney sweeps typically charge for chimney maintenance and repair tasks and how much you would save by doing the work yourself. (Chimney sweep prices vary by locality, but the infographic has averages.) Get the picture on when you really need a chimney sweep and when can you do it yourself. And identify the products you will need if you decide to do the work yourself. 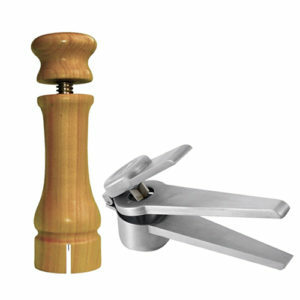 Professional grade chimney caps, dampers, and chimney repair products, the same ones certified chimney sweeps use, can be purchased from FireplaceMall.com. This Your Wallet vs Chimney Sweep Infographic also lists the annual inspection and maintenance tasks homeowners should consider for their fireplaces and chimneys. If you should decide to have a chimney sweep do some of the maintenance tasks, be aware that folklore has it that chimney sweeps can do more than clean and repair your chimney: they can also bring your home good luck! Learn when it’s not only good luck but also prudent to hire a chimney sweep and when it’s good luck for your wallet to DIY. 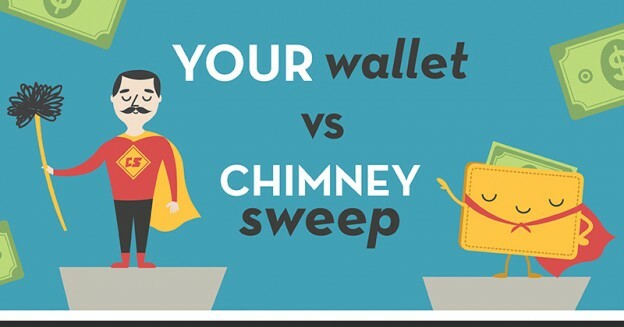 Your Wallet vs. Chimney Sweep – DIY or Pay? Use the Christmas Fireplace Safety Checklist below to keep your family safe around the fireplace during the winter holidays. 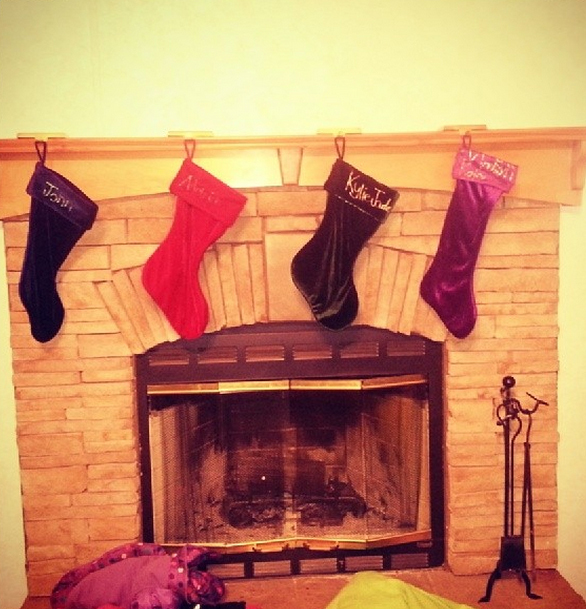 Are your Christmas stockings hung on the fireplace mantel with care? In the famous Christmas poem, the stockings were not just “hung by the chimney;” they were hung “with care.” Even in the midst of describing a nocturnal visit from Santa, the author noted one important aspect of Christmas fireplace safety! 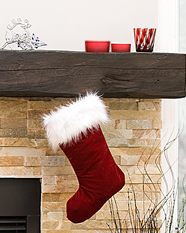 Yes, you can hang the Christmas stockings from the fireplace mantel but ONLY when there is no fire in the fireplace. 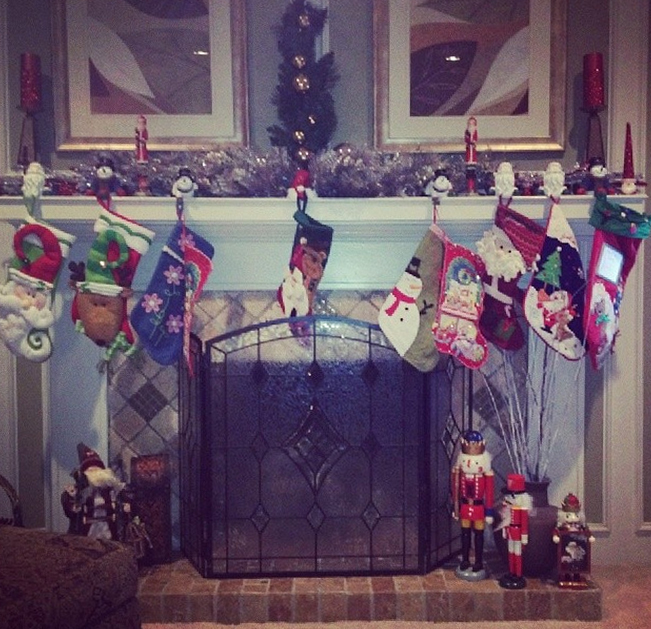 Plan on arranging safe places you can move the stockings to when you want to light your fireplace. Some people move the stockings to small hooks concealed on a stairway banister, on a room divider, on a book case, on the molding around an archway between two rooms, or on the inside doors of the television cabinet. Place Christmas trees safely away from the fireplace. Three feet away from the fireplace is the minimum recommended distance. 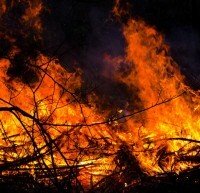 No one wants a forest fire, even if it is a solo tree fire, to ruin the holiday spirit! Ammonium sulfate, a fertilizer found in the gardening section of hardware stores, can make your fresh Christmas tree fire retardant (though not fire proof). 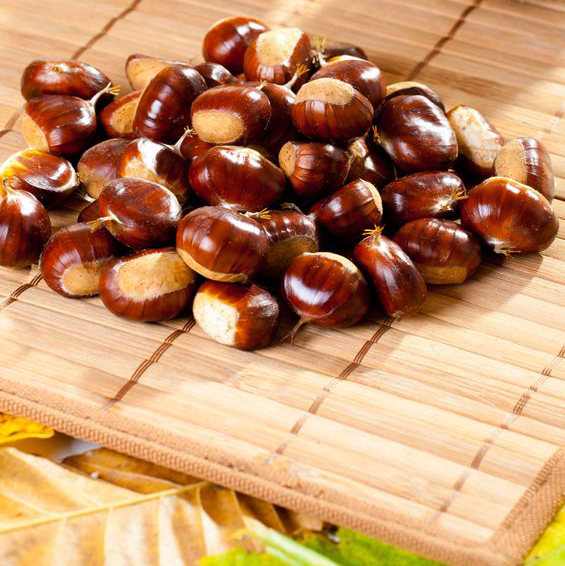 For an average-sized cut tree, mix 9 pounds of Ammonium Sulphate and 2 gallons of water in a bucket. 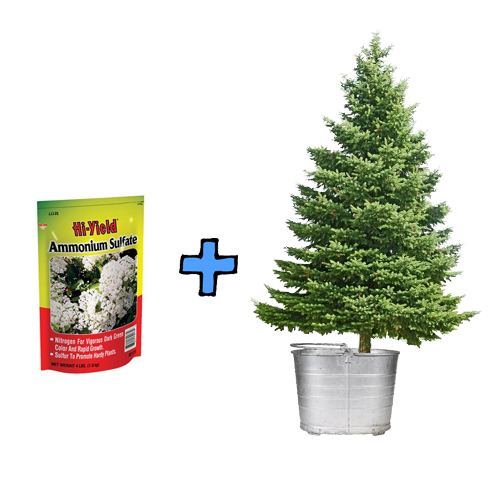 Set the tree in the bucket for 48 hours in a cool, dark place (such as an unheated garage) before bringing the tree inside to decorate. Christmas presents, too, need to be kept at a safe distance – three feet – from a burning fire. That wrapping paper can go up in flames quickly! 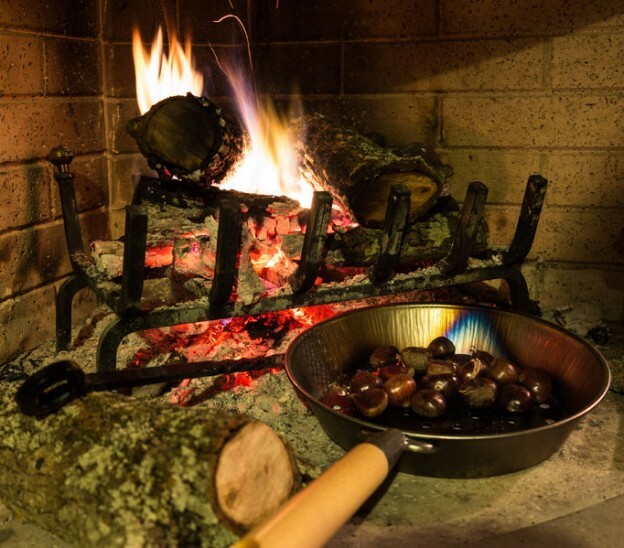 Fireplace Gift Baskets are delightful holiday gifts and add a festive charm to the hearth, but because they contain fire starters such as pine cone starters and fatwood fire starters, you will certainly want to keep them not too close to the actual fire. When decorating your fireplace mantel for Christmas, keep combustible material such as holiday greenery and ribbons safely on the fireplace mantel, not draping over the edge of the mantel. A stray fireplace spark can ignite holiday decorations exposed over the fireplace mantel’s edge unless your fireplace screen is a spark guard. Fireplace spark guards (also know as spark arresters) are a type of fireplace screen specifically designed to prevent this. Providing more spark protection for your room than most fireplace screens, the top of spark guards’ screens curve up and seal against the fireplace surround. 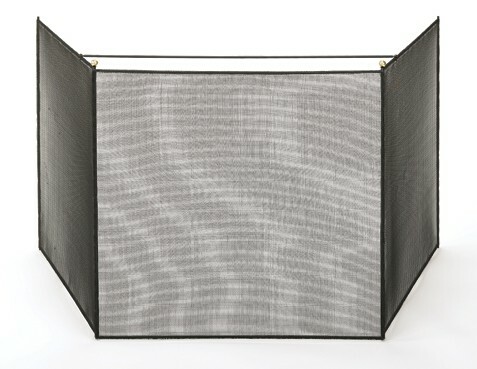 These spark guard fireplace screens protect your home from sparks that might try to shoot up and out of the fire. Candles add a lovely touch to Christmas fireplace mantel decorations. Consider using electric candles. If you are using real candles, to protect your mantel decorations from candle flames, use only candles with glass protection around the flames. Votive Candles in votive holders work safely on fireplace mantels. Votive candles and jar candles shield their surroundings from the flames. For other candles, consider using hurricane candle shades, available from craft stores, to safeguard your mantel decorations from candle flames. Young children and pets are charmed by the flickering flames and warmth of a fireplace fire. 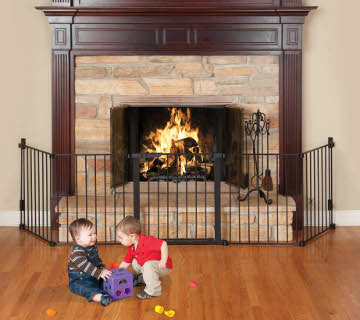 Fireplace safety gates (as seen at right) and fireplace child guard screens (such as the one below) are designed to keep two-footed as well as four-footed little ones at a safe distance from fireplaces and wood stoves. 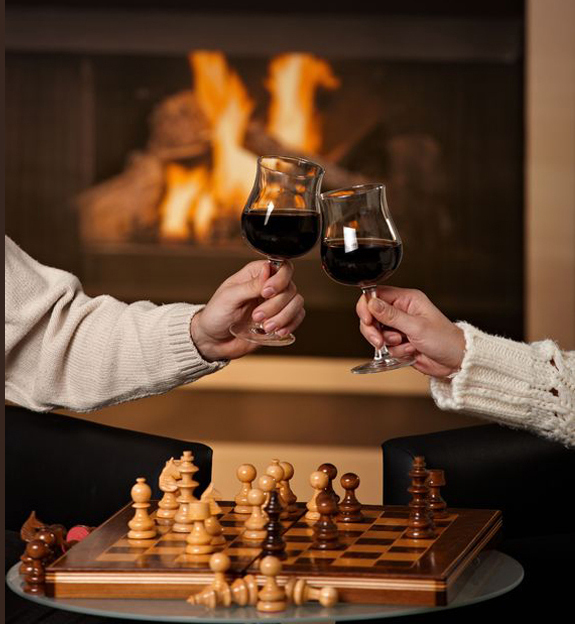 The safety gates have the advantage of allowing adults easy access to the fireplace for tending the fire. 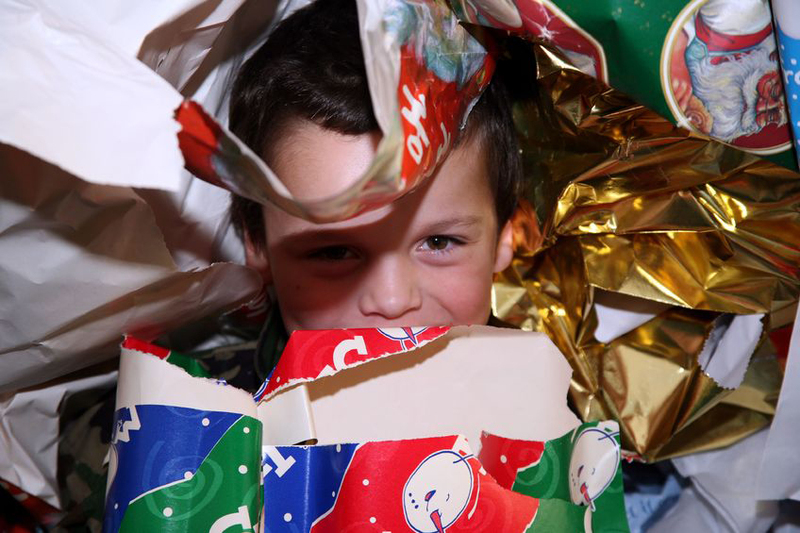 As Christmas gifts are unwrapped, do not burn the used wrapping paper in the fireplace. The colored papers can release toxic fumes when burned. When it is time to take down the Christmas decorations, do not burn the Christmas tree in the fireplace. All that unseasoned pine could start a chimney fire! Instead, recycle it or haul it away. 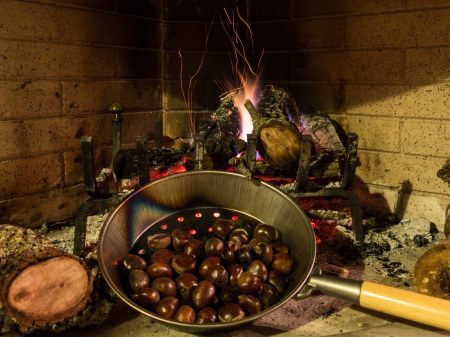 The winter holidays, with family, friends, and home taking center stage, are a time of heavy fireplace use. 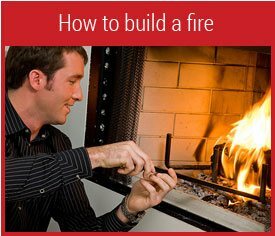 Keep your hearth both merry and safe by following these simple but important Christmas fireplace safety policies. A fireplace is so integral to Christmas that hanging the stockings on the fireplace mantel is a tradition that many families look forward to each year. As a safety note, please remember to remove the stockings when your fireplace is lit. On Christmas eve when all head to bed, the fire will be safely out so stockings can be hung and Santa can make his traditional entrance safely. 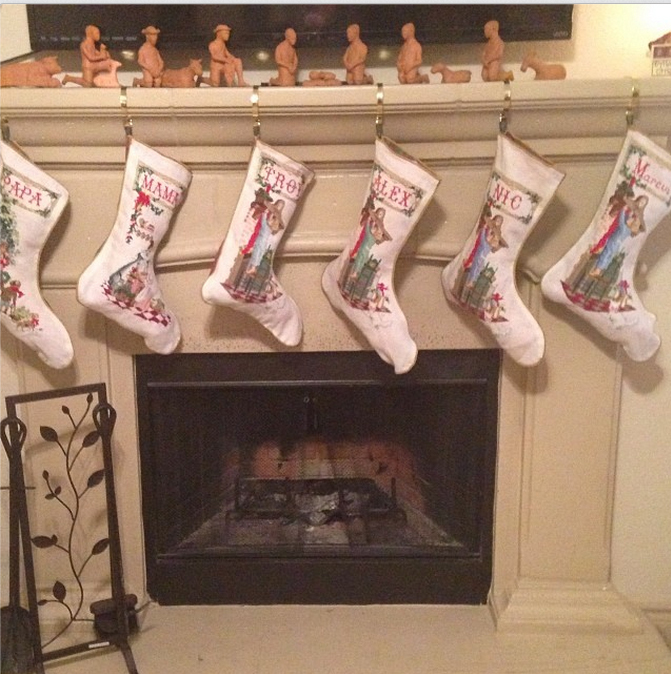 Some FireplaceMall.com friends have generously shared photos of their stockings hung by the chimney. 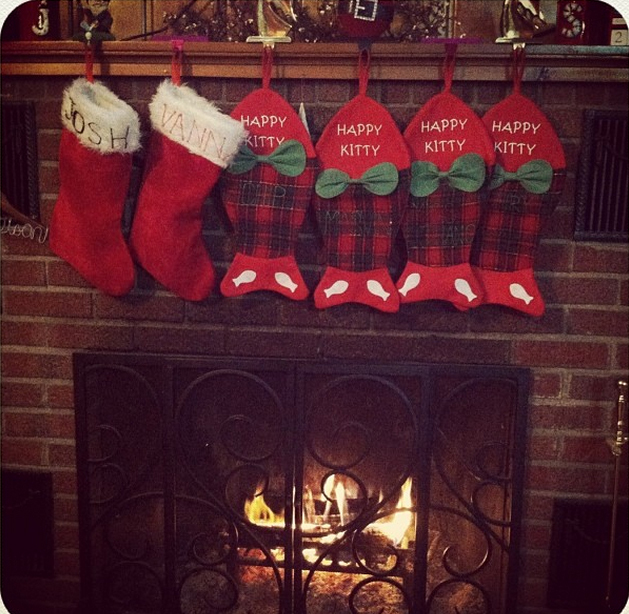 Find inspiration from their stocking designs and holiday fireplace decorations! This drama of this huge stone fireplace speaks for itself. The nine matching red and gold stockings keep it simply elegant! The sparkle and glow of this pair of stockings are highlighted by the stars and lights on the mantel. The cream colors, brass fireplace doors, and dark brick fireplace all work so well with this trio of personalized cranberry and hunter green stockings. Cranberry and hunter green stockings are a classy take on traditional Christmas colors. Photo courtesy http://twitter.com/cuteculturechic. The patchwork stockings capture the texture and variety of the rocks in this awesome fireplace wall. Lights, Christmas balls, and themed stocking hangers coordinate their colors with the stockings’. 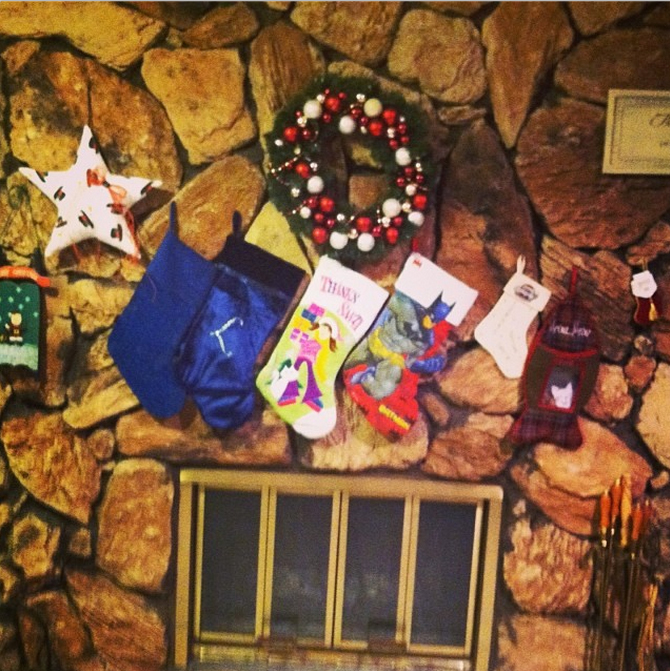 Patchwork and applique stockings hang from the mantel of an awesome fireplace. Photo courtesy http://twitter.com/docksteader. Red, green, white and a cheery holiday plaid combine in these smile-inducing, fishy stockings for the felines of the household. Plaid, fish-shaped stockings join the ones for the humans on this cheery holiday hearth. Photo courtesy http://twitter.com/garbisongirl. This jolly mantel and hearth signifies the abundance of Christmas and the love for all our family members including the furry ones. 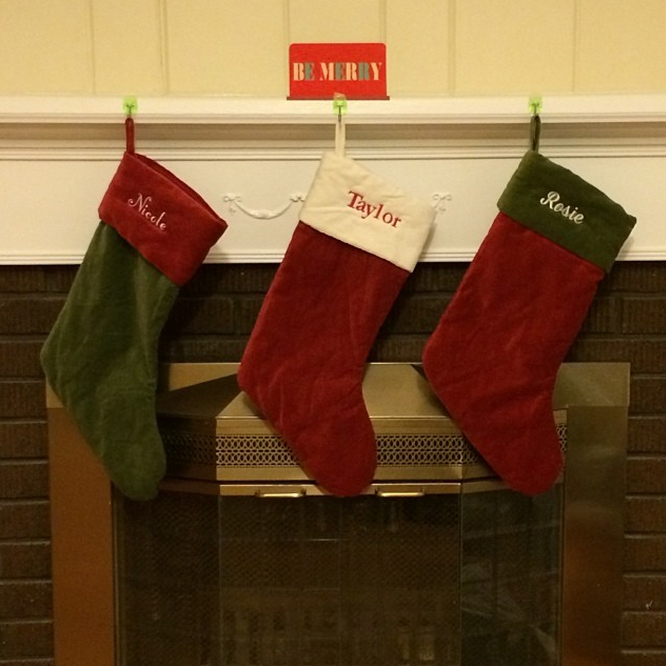 Note that each cat’s stocking is labeled with its name. Eliminates the Christmas morning cat-fights, we’re sure. How many tiny stitches went into the creation of these remarkable cross stitched stockings?! Each one unique and all in the same color scheme, these lifetime treasures were handmade by a mom of five teens. Santa will have no trouble telling which fun stocking hanging on the impressive stone wall of this fireplace belongs to which family member! A Christmas ball laden wreath pulls it all together. What could make a grandmother more delighted at Christmas than to have the grandkids’ stockings, each as individual and charming as the children are, adorning the fireplace? The prominent keystone and the arch of this stacked stone fireplace are both repeated in the design of the mantel. Brass stocking holders echo the brass in the fireplace doors. 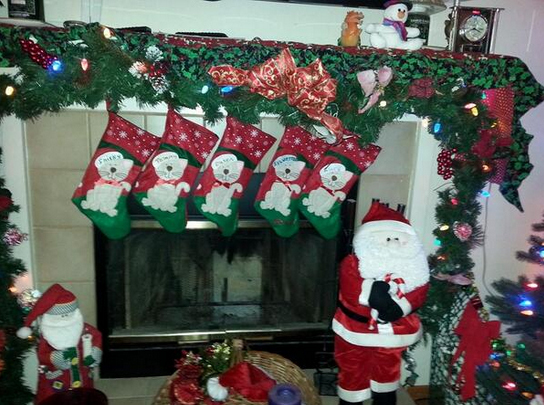 The stockings hanging from the mantel of this arched fireplace await Santa’s treats. Photo courtesy http://twitter.com/MariaRollan. 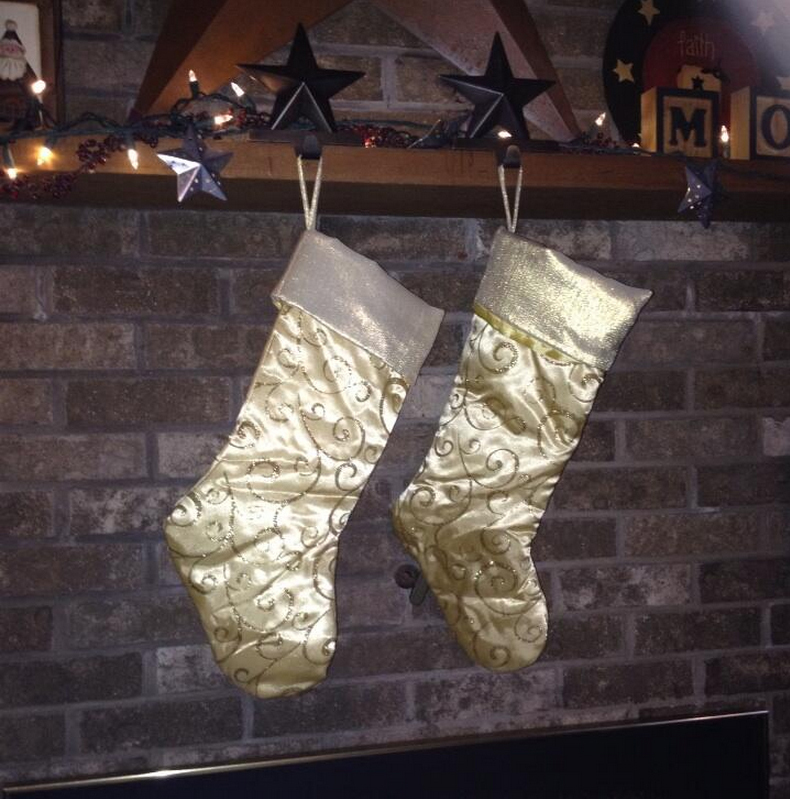 Lest there be any doubt, these stockings are officially hung by the chimney with care. 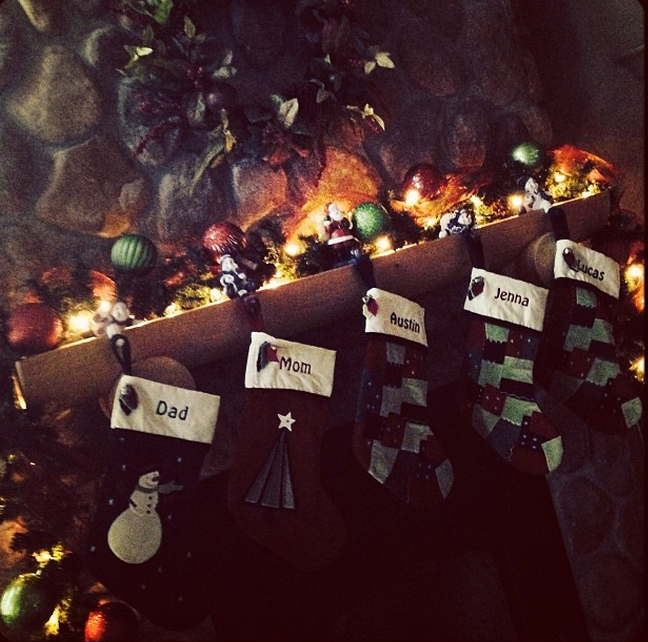 What a clever, convenient and charming way to display the stockings! 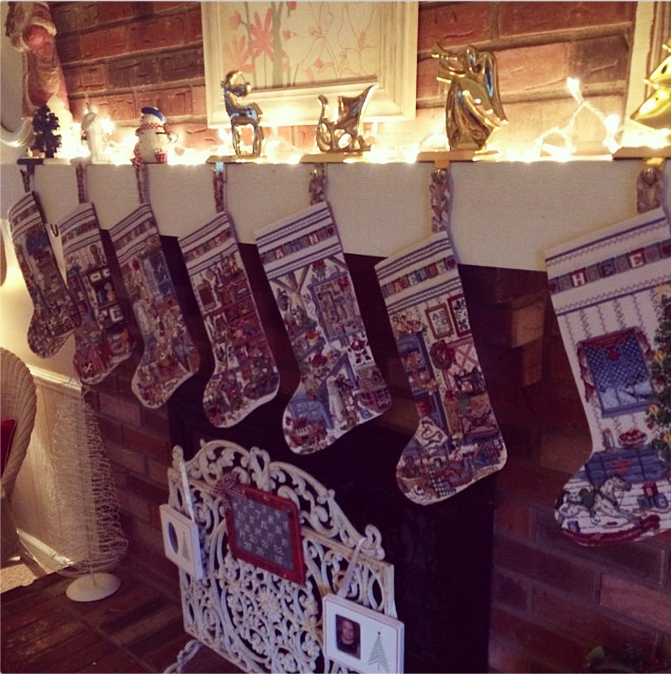 A talented grandmother cross-stitched each of these stockings. The last one was completed just in time to hang on the family’s mantel for their first Christmas with a fireplace! Atop the mantel is a creche scene. 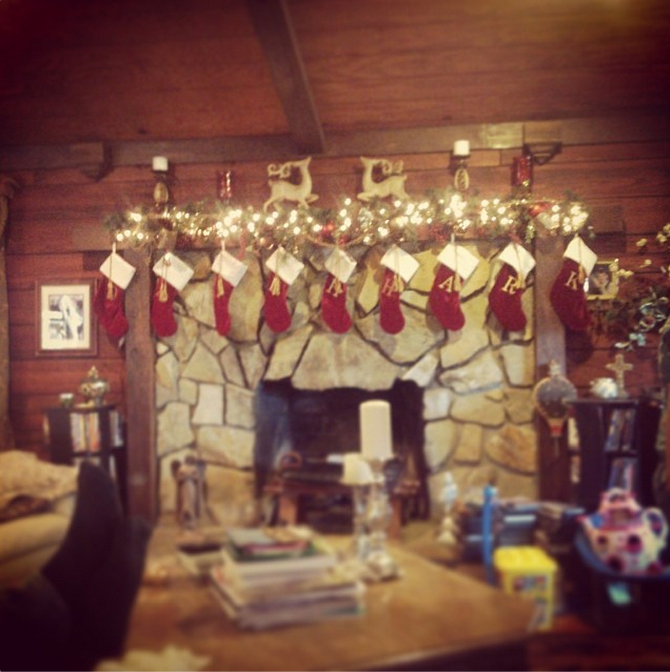 All of these Christmas stockings were hung with care and love above the fireplace, the natural gathering place not only of family and friends but also of Santa as he fills those empty stockings. To ready your fireplace for stocking-opening day, update your fireplace screen and replace your fireplace tools if they have seen better days.